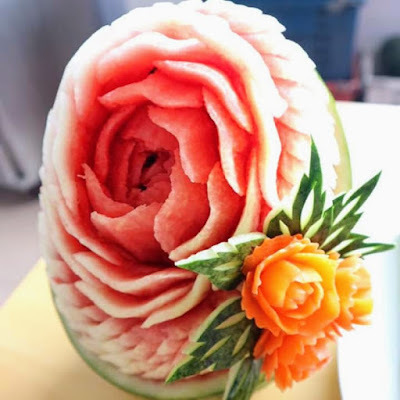 Purpose of teaching of fruit carving methods and techniques, proper use of fruit carving tools, selection of fruit for quality, care of fruit after carving. Chef recommend starting carving with leaves, flowers. Fruit carving is an ART, not a science. The more you practice, the more you will learn and the more proficient you will become. Such beauty,detail get in touch with the artist in you. Taught by our Master fruit carvers Kru Ying, Kru Somsuay, Kru Dow. Come learn from them how to carving the techniques and become as good as you can be. Here’s just a sampling of what you can learn to do. All it takes is great instructors, some talent. Present fruit carving adds so much to a served meal. What a great way to impress your friends and customers. It demonstrates to them that they are very important to you. This in turn adds value to the meal being served. Your friends and customers will recognize this, and you will directly benefit from this perception too. **SPECIAL** 2,000 Baht for beginner classes!! Remark: Please booking 1 day in advance please.